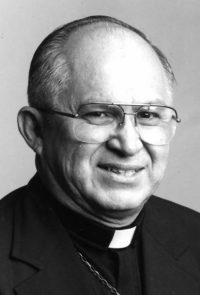 SAN ANTONIO (CNS) — Retired Archbishop Patrick F. Flores, 87, the first Mexican-American bishop in the United States, died of pneumonia and congestive heart failure Jan. 9 at Padua Place Residence for retired priests in San Antonio. The bishop, who dropped out of school to be a migrant farmworker, was known for his support for farmworkers, Mexican-American civil rights and his love of his culture and heritage. A funeral Mass was scheduled for Jan. 17 at San Fernando Cathedral in San Antonio with Archbishop Gustavo Garcia-Siller presiding. The archbishop also will celebrate a Mass for the Dead Jan. 16 at the cathedral followed by visitation. Archbishop Flores, born in Ganado, was one of nine children and called “Ticho” by his family. His younger sister, Mary Moreno, told Today’s Catholic, newspaper of San Antonio Archdiocese, in 2004 that her brother would often walk up and down the road in front of the family home praying the rosary. “He was always very close to God,” she said. He also had a light side, often winning dance contests with his sister Mary, and played a number of instruments and sang. He was ordained to the priesthood in 1956 in the Diocese of Galveston-Houston and was appointed auxiliary bishop of San Antonio in 1970. Eight years later, he was installed as bishop of El Paso, and in 1979, he was appointed archbishop of San Antonio. He was a member of the Immigration and Refugee Department of the U.S. Catholic Conference, chairman of the Church in Latin America Committee of the National Conference of Catholic Bishops, and chairman of the Texas Advisory Committee to the U.S. Commission on Civil Rights. In 1987, he welcomed Pope John Paul II to the San Antonio Archdiocese as part of the pope’s nine-city tour. The pope celebrated Mass for a crowd of 330,000 people in a field that is now the site of John Paul Stephens High School. The Mass still holds the record for the largest gathering in the state. In an interview with Today’s Catholic newspaper in preparation for his retirement, Archbishop Flores said what he remembered most fondly of his time as archbishop was simply his life as a priest. “I have found it very challenging and very satisfying. So I’ve been happy at it and will continue to be happy,” he added. Following Archbishop Flores’ retirement, he resided briefly at Casa de Padres retirement center for priests of the archdiocese, but he spent the past several years at the Padua Place residence for priests needing medical assistance.